The Xtorm Power Stage is the ideal solution to charge different Apple devices at the same time. The Power Station Stage can give the Apple Watch, iPad mini and iPhone new energy at the same time. The Apple Watch can easily be placed at the dock and the charging process starts automatically. Left from the Apple Watch, the iPad mini or iPhone can be placed. Through the Lightning connector, the charging starts directly after placing the device. At the back side of the Xtorm Power Station Stage are two USB ports for two extra devices. The Xtorm Power Station Stage can charge four devices at the same time with only one AC outlet. The Xtorm Power Station Stage is made from high quality aluminium and has a luxury look. The Xtorm Power Station Stages has an official Apple Licence. The Xtorm Power Station Stage is the ideal home solution. Charges four devices efficiently, without the use of several AC outlets. This dock for Apple Smartwatch is the perfect charging solution for your Smartwatch. Equipped with a special charging spot for Apple iPhone 5 and iPad mini (and later models). This Stage Power Station is also compatible to charge other USB devices via the 2 USB outputs. In total the Stage Power Station is suitable to charge 4 mobile devices at the same time! 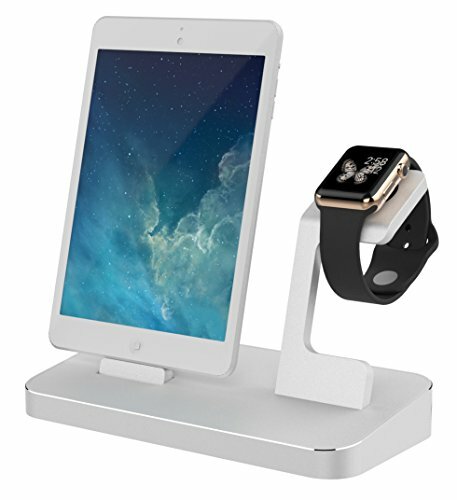 Stand to charge Apple iPad and Apple Smartwatch. Allows to put away the Smartwatch and iPad and prevents them against scratches or other damages during charging. If you have any questions about this product by xtorm, contact us by completing and submitting the form below. If you are looking for a specif part number, please include it with your message.